WARWICK-born winger Justin O'Neill is on standby to play his first State of Origin game in Sydney next week. O'Neill was born at the Warwick Hospital, christened at the Killarney Catholic Church and lived at Tannymorel for the first year of his life. He was christened Justin Germain O'Neill, his second name coming from the Christian name of his grandfather from Vanuatu, Germain Samsen. One of the three sons of Sean and Nicole O'Neill, he is the only one of the three born in Warwick. His father was merchandise manager at the Dalgety store in Grafton St, Warwick, in 1990-1991 when the family lived on the Southern Downs. The Warwick appointment was Sean's first after he returned home following a move to Vanuatu to manage a big plantation. He met Nicole and they were married in Vanuatu. 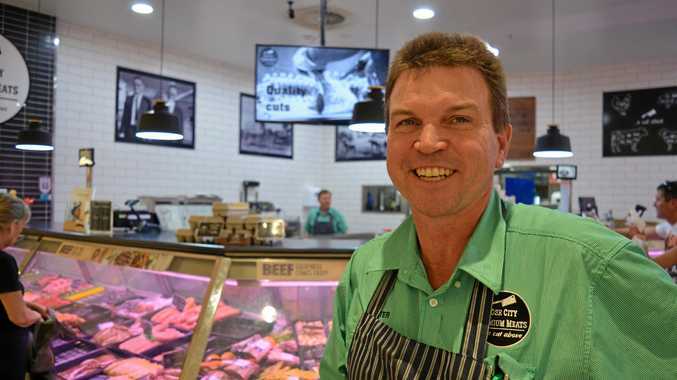 The family moved from Warwick to Hughenden after Sean was appointed manager of the Dalgety branch at Hughenden late in 1991 and still live in the North Queensland town. Justin spoke to his father from Melbourne Airport on Tuesday before he boarded a flight north to link with the Maroons in camp. He will come into the starting side on the wing if winger Darius Boyd is ruled out with injury. "He is over the moon to be in Maroons camp. It was one of his career goals," Sean said. "We are extremely proud of Justin." The Warwick-born centre/winger attended boarding school at Cathedral College, Townsville, and played club rugby league for Brothers and made Queensland and Australian schoolboys sides. Justin is not the only footy star in the family. Older brother Paul, a winger/fullback, who also lived at Tannymorel as a young boy, plays A-grade for Brothers in Townsville. He has represented Vanuatu, the country of his birth. The youngest of the boys, Samsen, is a centre/winger for the North Queensland Cowboys in the Toyota Cup under-20 competition. premiership-winning Melbourne NRL team last season. He scored a try in the grand final using the speed he showed as a schoolboy athlete. Justin won silver medals in the 100m and 200m at national level and two national titles in long jump while competing in athletics. If he is called into the Queensland team, the O'Neill family from Hughenden will be there cheering one the Warwick-born Maroons winger. Last year, Justin was inducted on to the Warwick Cowboys Wall of Legends at the clubhouse at Father Ranger Oval.